I believe this is a Tibicen lyricen, but I don't know for sure as this is the first time I have come across this particular species. However, I knew T. lyricens were in the area because my wife heard one a couple of days ago (she identified it by listening to the various audio recordings of Tibicens over at www.insectsingers.com)---This, of course, is why I am leaning towards identifying it as a T. lyricen. But, like I said, I don't know for sure. What an excellent series of photos of a female Tibicen lyricen. I am curious, how did you catch it? You don't mention it in your description. Anyway, regarding calling songs, we also have a number of calling songs right here on this web site. They are located under the videos tab or you can access the videos section from the footer below where it says video categories and click on calling songs. Your specimen reminds me greatly of a Tibicen lyricen sub species known as Tibicen lyricen virescens or T. virescens. I believe that T. virescens has been designated its own species. Typically, T. virescens sounds like T. lyricen males with the exception that they are considered a coastal species and are found in Florida and Georgia. However, it is highly suspected that they may actually range higher into South Carolina and North Carolina. I am excited to show this specimen to a colleague of mine and get his thoughts on it. I spotted her while taking the dog on a long midnight walk (well, at least that's the excuse I give my wife so I can go out around midnight to hunt cicadas). I found the T. lyricen under a streetlight, crawling along on the road. I just shined my flashlight on her, bent over, and picked her up. Glad you liked the T. lyricen. I must say that I am still quite excited about finding her. 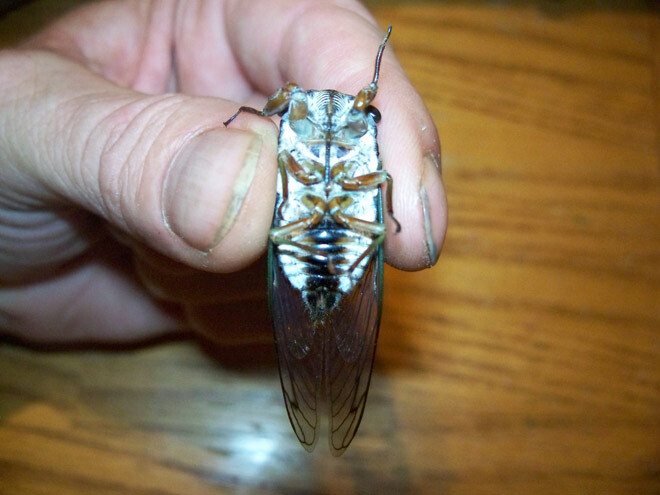 Not only is she an unusual find for me, her discovery has confirmed my wife's prowess at remembering and identifying cicada calls. My wife's ears are certainly more finely tuned than my own. She tells me that there is one more cicada she has heard calling that I have yet to collect. 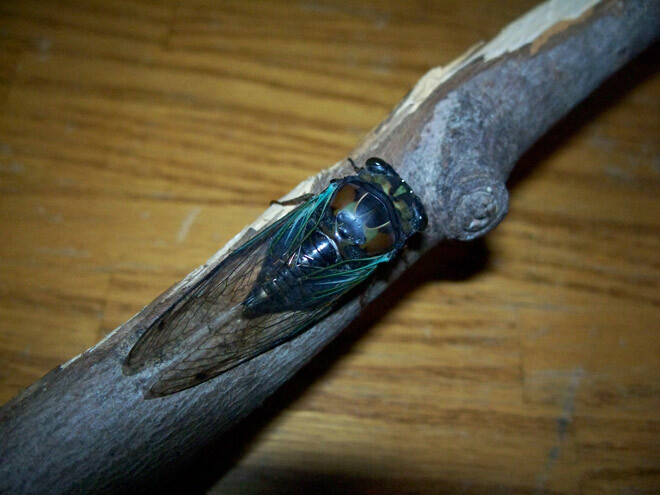 However, she hasn't been able to identify it via the online recordings of Tibicen mating calls over at insectsingers. So, I'll send my wife over to your audio/video archives and see if she can find it and figure out which species it is. 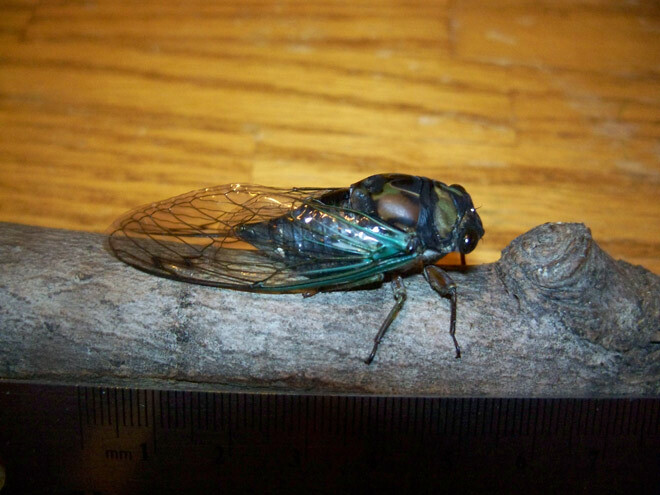 I think there are a lot more cicada species in Missouri than you think. So far I think you've sighted T. lyricen, T. tibicen, T. pronotalis, the Magicicadas and T. pruinosus. I wouldn't be surprised if you had T. auriferus, T. dorsatus and perhaps T. auletes. And don't get me started on other genera.